Silver and gold… The history of the remote Highland town of Wick is all about the ‘silver darlings’ – the shoals of herring that brought 19th-century prosperity – and whisky, the golden ‘nectar of Caithness’. Richard Woodard heads north. Whisky flows through the teeming pages of Wick’s rich history, from 17th-century battles through the Victorian herring boom and into the crusading efforts of the temperance movement in the 1920s. In that time, ‘the nectar of Caithness’ has killed people and lured them to their ruin; it has provided a livelihood to many, and been source of relief to many more; and it has, in its darkest days, inspired a period of Prohibition twice as long as that endured in the US. The shoals of herring – the ‘silver darlings’ that brought so much prosperity to this place – are a distant memory now, and the town hasn’t been ‘dry’ in 70 years. Still, the Pulteney distillery lives on as a physical reminder of Wick’s tribulations, surviving temporary closure and multiple owners to enjoy altogether better times in the early 21st century. On first impressions, the town has a serious, even severe look about it, drawn up around the focal point of the harbour – which now boasts a modern marina populated by pleasure craft, and RIBs (rigid inflatable boats) offering tourist trips to explore the dramatic coastline and its teeming wildlife. That’s some contrast to the picture 150 years ago, when there were so many fishing boats moored here that a person could reputedly walk from one side of the harbour to the other without getting their feet wet. But we’re getting ahead of ourselves; whisky first. As in so many parts of Scotland, in this north-eastern corner of the country the national spirit recedes into the mists of history; but, as long ago as the 17th century, it was part of everyday life. In July 1680, a dispute over the earldom of Caithness between Lord Glenorchy and George Sinclair led to a violent battle near Wick – the last of its kind on Scottish soil, and one in which whisky played a decisive role. The battle the following day was one-sided to say the least, with Sinclair’s hung-over troops driven into the river, many of them drowning. Shortly after Pennant visited Wick in 1769, a new trade came to the town that was to utterly transform its fortunes for the next century and a half. Herring fishing began to take off from the late 1780s, but the intervention of the British Fisheries Society in the early 1800s led to the creation of Pulteneytown on the southern banks of the Wick river – and the foundation of what was then the world’s biggest herring port. The scheme was the brainchild of Sir William Pulteney, a remarkable character who, when he died in 1805, was one of the wealthiest men in Europe, with a fortune equivalent to £5bn after judicious investments in the Americas (he is said to have owned half of Manhattan Island). Governor of the British Fisheries Society, Pulteney commissioned protégé Thomas Telford to draw up plans for a new town and fishing port to fully exploit the nascent herring boom. Pulteney died before it could be completed, but the town (and, later, the distillery) was named in his honour. Pulteney’s and Telford’s plans were ambitious, but they could scarcely have foreseen what was to come: by the 1830s, the volume of ships was such that an outer harbour had to be added – and that was just the beginning. In 1862, more than 1,100 fishing vessels were based at Wick for the summer season; the population of the town, normally just a few thousand, multiplied by three or four times when the herring fleet was in. Some lived on their boats, others in dormitories above the curing sheds, or in attics, cellars and outhouses. Outbreaks of cholera, typhoid and diphtheria were a frequent threat. Robbed of home and livelihood by the Highland Clearances, many had trekked for 100 miles across wild country for a chance of work and pay. Most had little or no experience of fishing; accidents and fatalities were frequent as a result. Not just men, either. The ‘herring lassies’ descended on Wick in their many hundreds, spending 12 weeks each summer gutting and packing the ‘silver darlings’ before following the herring south to Great Yarmouth and Lowestoft. The peak was reached in 1867 when, it is said, 3,500 herring lassies gutted 50 million herring at Wick in just two days, packing them into barrels for export to England, to Scandinavia, to Russia and the US. Some 650 coopers were resident in Wick at this time, coopering 125,000 barrels a year to cope with demand. When the local oak was exhausted, they used larch, birch and fir; when that too was gone, birch, ash and Scandinavian fir were imported from Norway. This was thirsty work, as one James Henderson was swift to recognise. The records state that he had ‘attended to a small distillery owned by himself’ at the family farm in nearby Stemster from about 1819, but seven years later he abandoned this ‘unofficial’ enterprise to go legit in partnership with local businessman John Kirk. The licensed distillery – then making Henderson’s Whisky and later to become Pulteney – was soon very busy indeed. During the 1840s, the town had no fewer than 41 licensed premises (20 in Wick, 21 in Pulteneytown) and, in 1844, it’s reckoned that more than 800 gallons of whisky – roughly 5,000 bottles – were being consumed every week. And this wasn’t mature, 40% abv whisky, but fiery new make at about 69% abv. ‘They used to fish every night, starting in the evening when the herring came up to the surface,’ says Malcolm Waring, Pulteney distillery manager. ‘They took stone flagons [of whisky] with them, and they drank. Despite all of this, Wick was also God-fearing, with the Sabbath strictly observed and prayer meetings heavily attended. There was a strong temperance movement – led, as you’d imagine, by the women who saw precious little of their husbands’ wages – and it is perhaps surprising that Prohibition took so long to come to the town. When it did, in 1922, times were already radically different. The First World War had taken its toll on the young male population, and the conflict, combined with changing tastes and rampant overfishing, had all but killed the herring boom. ‘There were 18,000 casks of salted herring sitting on the docks when the First World War broke out,’ says Waring. Fishing continued, moving on to white fish and cod; then, more recently, crab, lobster and scallops – but it never regained the heights of the Victorian age. Counter-intuitively, Prohibition did not mean the end for the Pulteney distillery; after all, it was a big world beyond the borders of Wick and, even in the town itself, ‘wayfarers’ could still enjoy a drink (but only with a meal). Pulteney’s stills ran on until 1930, through a few changes of ownership, until the Depression succeeded where Prohibition had failed. The distillery remained silent until 1951, four years after Prohibition in Wick was lifted. It has been in operation ever since, again with several different owners, before passing to Inver House Distillers in 1995. And, though much has changed – most notably through refurbishment in the late 1950s and post-1995 – this quirkiest of distilleries retains a flavour of the past in its cramped conditions, Heath Robinson-esque layout and two of the weirdest stills you’ll ever come across. The spirit, to its credit, is similarly characterful and distinctive. And now, beyond the distillery doors and downhill to the harbour, there’s a fresh scent of renewal in the air – and not just in the marina and the tourist-carrying RIBs. Up to £3bn is being invested in offshore wind farms here: a first tranche of 80 or 90 turbines, then – if all goes to plan – another 250, which would create one of the biggest projects of its kind in Europe. For Wick, this means jobs. About 200, in total, as most of the services for the farms will be located in the town. Some of the old buildings designed by Telford for the fishing trade are being restored, discovering a new life more than two centuries after they were built. And so the sea is once more bringing a livelihood to the people of Wick. One that may lack the scale of the 19th-century herring boom, but which promises to be far more environmentally sympathetic. From the harbour, up through the streets of Pulteneytown to the distillery, things are looking up again in this far-flung, but eternally fascinating, corner of Scotland. The Wick Heritage Museum is a remarkable institution. Staffed by volunteers, it is an incredible resource of artefacts, documents and information, including the Johnston Collection – 100,000 photographs taken between 1863 and 1977 by three generations of the same family. Rabbit warren? Aladdin’s cave? Take your pick – and take your time. The Wick Heritage Centre, 18-27 Bank Row, Wick, Caithness KW1 5EY; telephone +44 01955 605393. Open from Easter to the end of October, Monday to Saturday, 10am to 5pm. You’re advised to book in advance if you want to visit Pulteney distillery. Tours take place at 11am or 2pm, and the visitor centre is open Monday to Friday from 10am to 4pm between October and April; and Monday to Friday 10am-5pm, plus Saturday 10am-4pm, between May and September. 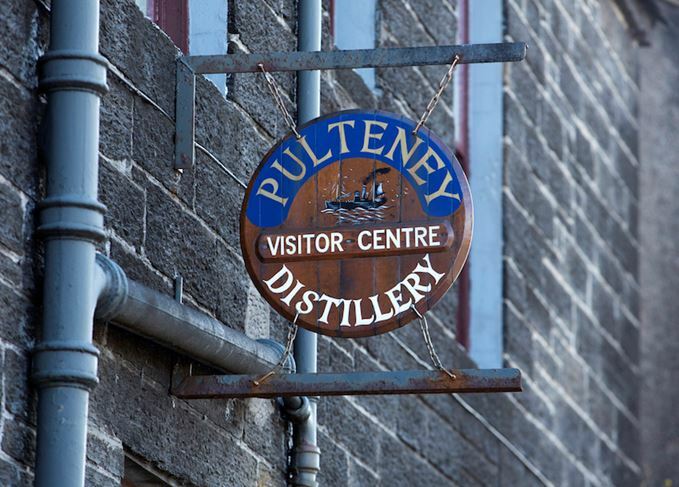 Pulteney Distillery, Huddart Street, Wick, Caithness KW1 5BA; telephone 01955 602371. Caithness Seacoast promises ‘exhilarating sea tours’ (and they’re not kidding), exploring the East Caithness coastline using its two-engine RIB. Various options, open April to October and in winter by arrangement. Caithness Seacoast, South Quay, Wick Harbour, Wick, Caithness KW1 5HA; telephone 01955 609200. Bord de l’Eau restaurant offers an unexpected but enjoyable taste of France in Scotland’s far north, with seafood (as you’d expect) a highlight. Bord de l’Eau, 2 Market Street, Wick KW1 4AR; telephone 01955 604400. You can’t really come all this way without visiting John O’Groats, taking the obligatory selfie next to the signpost and gazing wistfully across the water to Orkney. There’s not much to the place, with the stunning exception of Natural Retreats, which offers a selection of luxury apartments and lodges. The view’s not bad either. Natural Retreats, John O’Groats; telephone 01625 416430. On the road less travelled, embracing a rich culture, history and sense of renewal. The launches follow the withdrawal of the distillery’s 17-year-old and 21-year-old malts. Lack of stock means expressions will be discontinued – but no increase in NAS products.